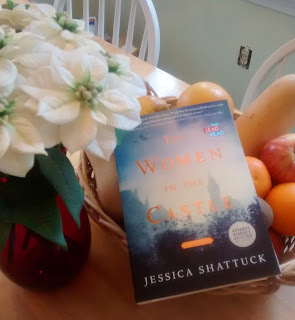 The Women in the Castle by Jessica Shattuck is a beautiful novel though it is set during one of the darkest periods in modern history - WWII Germany. I was excited when I won an advance reader copy through a Goodreads giveaway. World War II set novels are among my favorite subgenres of historical fiction. I have read it since I was in school and was introduced to The Diary of Anne Frank. Over the last few years though I have sought out different perspectives in the WWII stories I read as I was growing tired of the concentration camp or allied forces focused plot lines. My first experience was with Chris Bohjalian's Skeletons at the Feast (read my review). If that book hadn't led me to start this site, then The Women in the Castle definitely would have. Much like with Bohjalian's book, Jessica Shattuck's novel blew me away. The story opens in 1938 Germany. Few people in the country see that Hitler isn't the savior he claims to be. In the shadow of recent, disturbing events, Marianne von Lingenfels, niece-in-law to the countess, prepares for the annual harvest party. It is the perfect setting for what many Germans at the time would deem most un-German - the plotting of the assassination of Adolf Hitler. Throughout the novel, readers are treated to flashbacks to that night and the plot that was hatched, but most of the story takes place in the years following the war. In 1945, Marianne von Lingenfels is desperately trying to fulfill the task set for her that night of the party - to look after the wives and children of the conspirators. She was unable to do much during the war, but now is searching to put families back together and do what she can. She is the perfect person for this job. I don't know how Shattuck named her characters, but Marianne von Lingenfels has the perfect name. She has the air of an aristocrat and you can just envision her marching up to whoever is in her way and stating, "I am Marianne von Lingenfels...". She has the skills and heritage to do what little in the confusion of after war chaos could do. While there were presumably other children and wives, Marianne is only able to locate Benita, the wife of Marianne's childhood best friend, and her child Martin, and one other woman with her children. I don't know if Marianne stopped looking or if there was just no way to find them, but I felt this bit of the story was left hanging. Have you ever wondered how a country where citizens had been so brainwashed could function after the war? I don't think in any of my history classes we covered what happened to the people. There was a program of denazification put into place (at least in the American and British held areas, I'm not sure about the Soviet area). I don't think it lasted long (at least in earnest), and I'm not sure how effective it was. Part of the denazifaction program, there were mandatory viewings of newsreel footage. "Every day the American and British radio programs broadcast new and grisly stories about the Nazis and the horrors of the camps they had liberated. But almost no one listened." pg 93. And though Marianne was clearly not a Nazi, she felt it was her duty to listen to the reports with her children. The people in the village around the castle feel it is just American propaganda, and they are holding fast to their Nazi beliefs. Benita doesn't care to listen to the reports, but I think it is for a different reason. She didn't have the familial lineage to protect her after her husband was convicted like Marianne did. And life during the war had ben harsher for her. I suspect she wanted to put the whole thing behind her. I won't say much about the third woman as there is a bit of a twist with her story. She is the character we don't hear much from until towards the end. The story is told in 3rd person limited, but some chapters are told with more insight into Marianne's thoughts and actions while others focus on Benita and then later Ania. However, for me some of the most poignant statements in the book involved Ania. And the answer to the question I was always wondered - how did you not know? Her answer - she knew but did not want to know and in essence turned a blind eye. 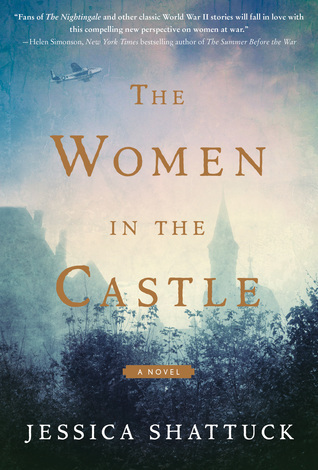 The Women in the Castle will definitely be one of my top 5 favorite novels read this year. It is poignant and eye-opening. It is also an enjoyable read with wonderful characters. I think Shattuck has created a well-researched novel and her characters embody people that could have lived during the period. I love that she didn't just focus on a year or so after the war, but continued the story all the way to the 1990s, which brought many plot threads full-circle and nicely wrapped up the lives of the three women. I can't praise this book enough. The Women in the Castle should definitely be on your to-read list.